Fans of Game of Thrones have been left stunned after one of its biggest characters was killed off in the season five finale. 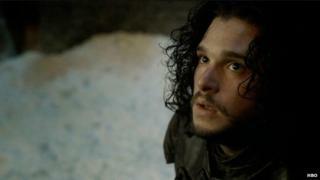 The episode saw Jon Snow, played by British actor Kit Harington, murdered by men of the Night's Watch. The final scene saw Snow's young protege Olly deliver the final blow, with a lifeless Lord Commander left lying in the snow. Variety described it as "one of the most shocking TV moments of the year". Fans expressed hope that Harington would return in the next series, but speaking to Entertainment Weekly he said: "I'm dead. I'm not coming back next season." "I kind of knew it was coming. I didn't read [George RR Martin's novel] A Dance with Dragons. But I read the other books and I had heard this is what happens. "So I had an inkling it should be this season. I didn't realise it would be the final shot of the season and that made it extra special. "I loved how they brought Olly in to be the person who kills me." The actor said the show's creators, David Benioff and Dan Weiss, had informed him of his impending doom before production on the fifth season began last year. "We did the Tony Soprano walk [to tell an actor they're going to die]. And they said, 'Look, you're gone, it's done.'" Fans took to Twitter to express their shock at the episode. Robert Kazinsky said: "Totally felt like that was put in for shocks sake only, and I'm totally okay with that. Just when you thought it was safe to care again." James McDougall tweeted: Well #GameofThrones it's been swell. See you again in 8 months. Should be enough time work with my therapist to get over this last season. Brenda Vanessa said: "This show is dead to me. I'm cancelling my HBO subscription. I hate you." Gene Rol tweeted: One day @HBO will admit #GameofThrones was a social experiment to see how much abuse an audience would take for entertainment's sake. Nimeuh added: "There's really no one left to kill on #GameofThrones. Next season they start killing viewers at home through the TV." A number of other characters also met their demise in the finale, including Stannis Baratheon - who was executed at the hands of Brienne of Tarth, just hours after his wife, Queen Selyse, hanged herself. It also featured a scene where Cersei Lannister - played by British actress Lena Headey - was stripped naked after having her head shaved and marched through the streets in a public walk of shame after admitting she had slept with her cousin. Fans praised the actress's performance: "I know it's just acting and all but I can't imagine how difficult that scene was for Lena Headey," Christina Jones said. "There needs to be a bravest actress in TV history category at the next #Emmys so they can give it to @IAMLenaHeadey," Russ Evansen said. Lynette Rice added: "If Lena Headey doesn't get an Emmy for tonight's performance, there is no TV God." The episode was screened in the UK on Sky Atlantic at 02:00 BST - in a simultaneous broadcast with US broadcaster HBO. It will be repeated on Monday night at 21:00 BST. Game of Thrones is back with series five... any good then?